St. Nicholas of Myra…..St. Gregory of Nyssa…..St. John of Damascus….We have longed become used to the idea that the great saints of the Church were from far away lands in times long past. Yet there lived among us here in America a modern miracle worker, man of prayer, spiritual father, and bishop. 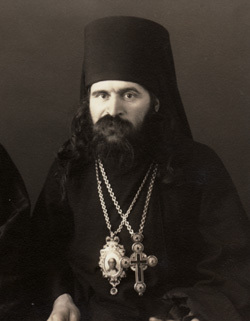 Archbishop John Maximovitch of San Francisco was widely regarded as a miracle-working living saint and perhaps the holiest man of the 20th century even before his death on July 2, 1966. On the s urface, St. John’s life is not all that remarkable: he was born in Russia in 1896 where he attended law school, graduating in 1918. With the outbreak of the Russian Revolution he and his family were evacuated to Serbia where he entered the seminary, was tonsured a monk and ordained a priest. 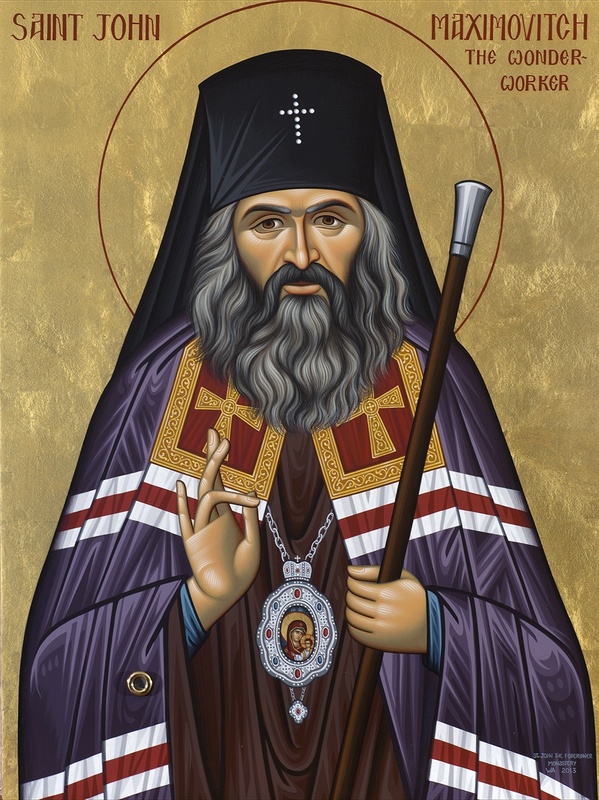 Even at this young age, the bishop there – St. Nicholas Velimirovich, often said: “If you wish to see a living saint, go to Father John”. St. John manifested his love by his zealous work in caring for the sick, visiting them personally despite the hour or weather. A special concern of his was the founding of an orphanage for orphans and the children of needy parents. St. John himself went into the slums and alleys of Shanghai to gather the sickly and hungry children. In 1951 St. John was assigned to oversee the Western European Diocese. There he continued his pastoral work which attracted the notice of many outside the Orthodox Faith. A Roman Catholic priest, speaking to his youth said: “You require proof. You say there are no more miracles, no saints. Why do you need theoretical proof, when a living saint walks the streets of Paris,, Saint Jean Nus Pieds (St. John the Barefoot)." Archbishop John is my favorite among our bishops….He is constantly filled with such a deep peace and joy that it is spiritually beneficial just to be in his presence. I was present at several crucial moments in the past months when he was surrounded by excited, weeping, practically hysterical crowds but he was exactly the same as ever, still calm and even joyful. The court case made headlines in the San Francisco newspapers and while St. John was ultimately vindicated, it broke his heart to see his brother clergy joining in the attack on him. Many believe that it was this sorrow that hastened his sudden death while on a parish visit to Seattle on July 2, 1966. After celebrating the Divine Liturgy that morning, he remained in the sanctuary for three hours praying. Shortly after returning to his room to rest he suffered his fatal attack. His un-embalmed body lay in an open coffin in his San Francisco cathedral for six days with no signs of decay. His tomb, a chapel beneath the altar of the Cathedral, became a place of pilgrimage and prayer. When his tomb was opened in preparation for his 1994 canonization his body was found to be incorrupt and intact. 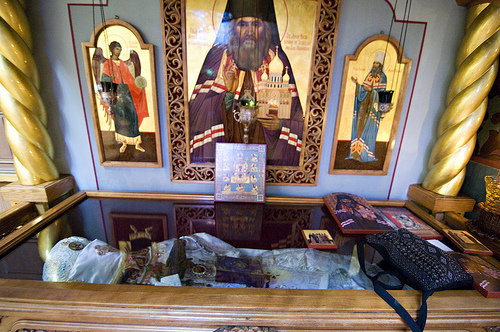 His shrine at the Holy Virgin Cathedral on Geary Boulevard in San Francisco has become a place of pilgrimage for Orthodox Christians from around the world. By worldly standards, St. John was not what one would call respectable. He was hardly the image of what most of us think a bishop should be. His hair and beard were unkempt, his lower lip protruded and he had a speech impediment that made it often difficult to understand his sermons. Instead of the glittering, jeweled mitre usually worn by bishops, he often wore a cloth “collapsible hat” pasted with paper icons. He wore clothing of the cheapest fabric and usually wore sandals with no socks, at times going barefoot. Several years ago I met a woman on Long Island who had known St. John in Paris. Unable to understand the ways of God and unable to see beyond his external appearance this woman considered Archbishop John an embarrassment and could see in him nothing more than an unkempt, eccentric, old, man. The secret to his power as a loving pastor and the secret of his power to perform miracles is to be found in his daily life. St. John celebrated the Divine Liturgy daily, and if for some reason he could not serve he would still receive the Lord in Holy Communion. He fasted strictly, eating only one meal a day. He never slept in a bed, only dozing for brief periods in an armchair, sometimes being found early in the morning prostrated before his icon corner. The single room in which he lived in San Francisco has been preserved as he left it: a desk, an icon corner, some cabinets, an armchair, but no bed! Despite his unconventional outward appearance, many people began to see in Archbishop John something unusual, a power not of this world. His life is a reflection of the promise of the Lord Jesus: “Truly, truly I say to you, he who believes in Me, the works that I do he will do also..” (John 14:12) Since his death in 1966 people have flocked to his tomb seeking his powerful prayers before the throne of God. The list of his reported miracles fill a book and include such occurrences as: restoration of mental health, healing of a hopelessly sick physician, help in finding work, healing of meningitis, healing of emphysema, healing of a paralyzed arm, auto accident victim restored to health…. While many are quick to approach St. John with requests for his miraculous intercession before the throne of God, the real significance of honoring St. John is in imitating his life. While we may not be able to go without sleep in order to pray throughout the night, each of us must have a time for daily prayer. We can imitate St. John by preparing carefully and receiving Holy Communion as frequently as possible. We can faithfully attend all the holy services offered in our parish so that the center of our life is the praise and worship of God. We can, like him, resist the temptation to lash out at those who attack and hurt us. While St. John was a holy man not everyone recognized this while he lived. As we read of St. John’s tribulations and persecutions, there may be some of us who find ourselves in similar situations: trying to serve God, to do what is right and yet we feel lonely and abandoned, facing obstacles every step of the way. Let us take heart and not lose faith and continue our efforts. St. John endured much worse but endured them all, and through the endurance of these sufferings is now glorified in heaven! Our Lord Jesus said: “He who endures to the end will be saved”. (Matthew 10:22) St. John, by his radical manner of life tried to jolt people out of their spiritual malaise into which we can so easily fall and taught us by his example to refuse to allow the Church to become a routine habit unable to change lives. The Church possesses the very presence and power of the Holy Spirit if we wish to receive it by freeing ourselves from our sinful passions and embracing our Lord wholeheartedly without excuse or reservation.